Traci Teraoka and her hound, Huckleberry, made Sacramento Street a more neighborly place. 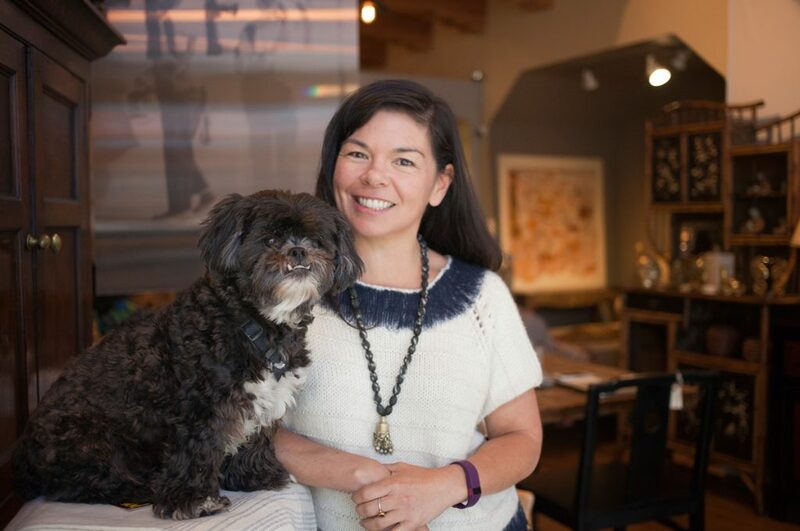 Traci Teraoka, the personable proprietor of Poetica Art & Antiques at 3461 Sacramento Street, believes in synchronicity. Growing up, her family moved every few years to accommodate her dad’s career in air freight. But after she landed in San Francisco two dozen years ago, she noticed roots growing out of the container of a lemon tree she’d bought. “I took that as a metaphor that it was time for me to put down real roots here,” she says. And she did — sending her son Alexander to nearby Town School and Drew School, establishing a small business and living upstairs above her eclectic shop, taking a leadership role in neighborhood organizations. “I really let myself be here on Sacramento Street more than any other place in my life,” she says. She even planted the lemon tree in her back yard — in the ground. But now she’s being uprooted. Teraoka and her business partner had an agreement that when Alexander was a year out of high school, she would buy out her partner, or they would sell the building. And now the time has come. For years, a treasure was hidden away on the second floor of Pets Unlimited, now a branch of the SPCA, at 2343 Fillmore. You could adopt a cat or dog to take home — or you could just stop by to pet a puppy, or to cuddle with a kitty. The adoption floor was the purrfect “therapy center” for folks who just wanted to spend time with the furry little ones, but didn’t want to make a commitment. No more. The SPCA has changed the rules. The animal hospital will stay put, but not the petting. 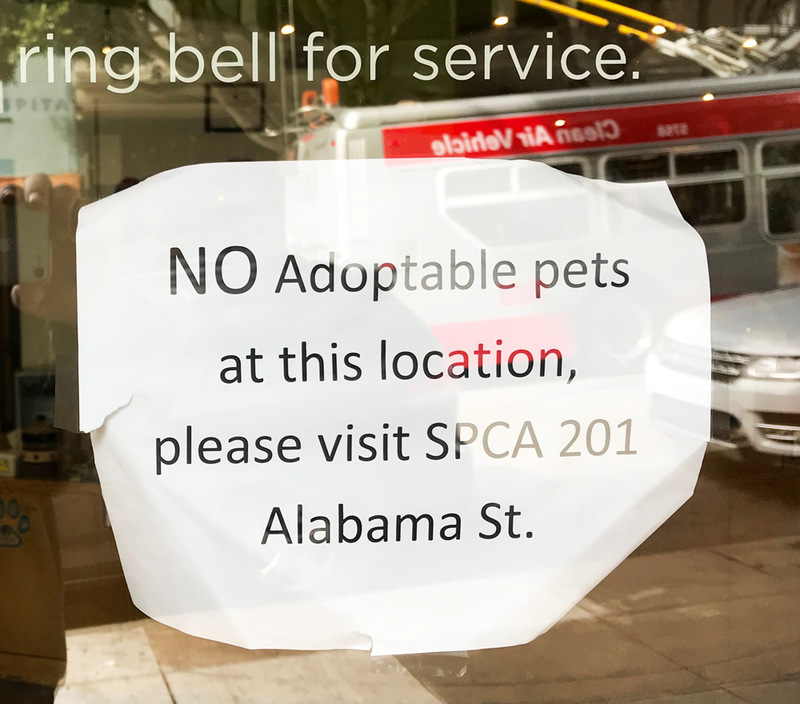 Now there will be “adoption events” only on certain days each month, but no more one-on-one getting-to-know-and-enjoy-you gatherings upstairs. Starting on Tuesday, March 12, and every Tuesday thereafter, a noon to 5 p.m. adoption session is planned, with similar events on Saturdays beginning March 23. Soon after her graduation from Smith College in the late 1940s, Glady Thacher took on the traditional roles of supportive wife and mother then mandatory for most women. But she quickly decided there was a loftier goal: reaching her full potential — and helping others reach theirs, too. 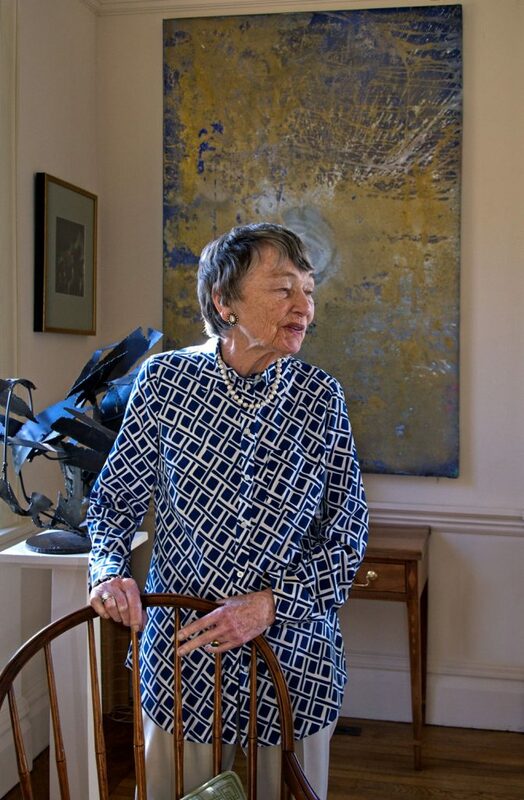 As a result, thousands of women, and not a few men, have Thacher to thank for broadening and enriching their lives — mostly through organizations she nurtured and launched in her own living room. 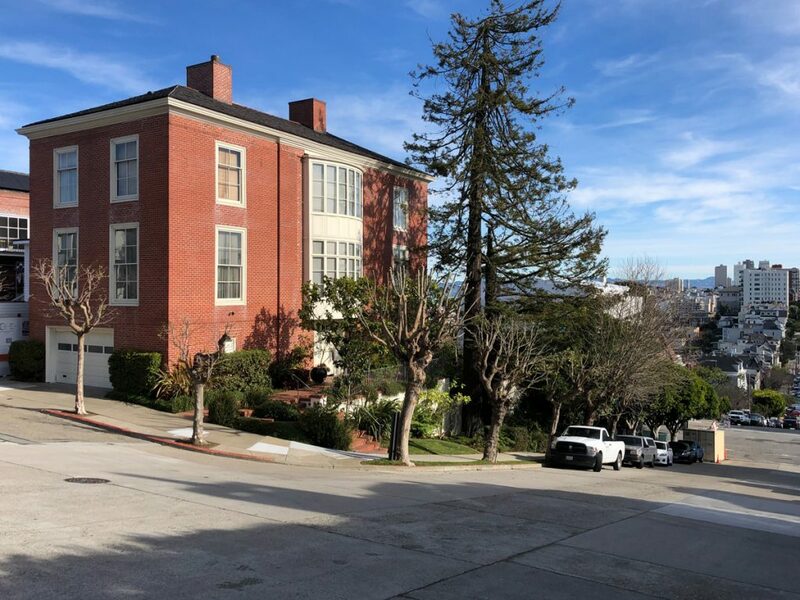 In fact, there’s no wall around Pelosi’s longtime family home, although the red curb prohibiting parking near her house does have a fresh coat of paint. 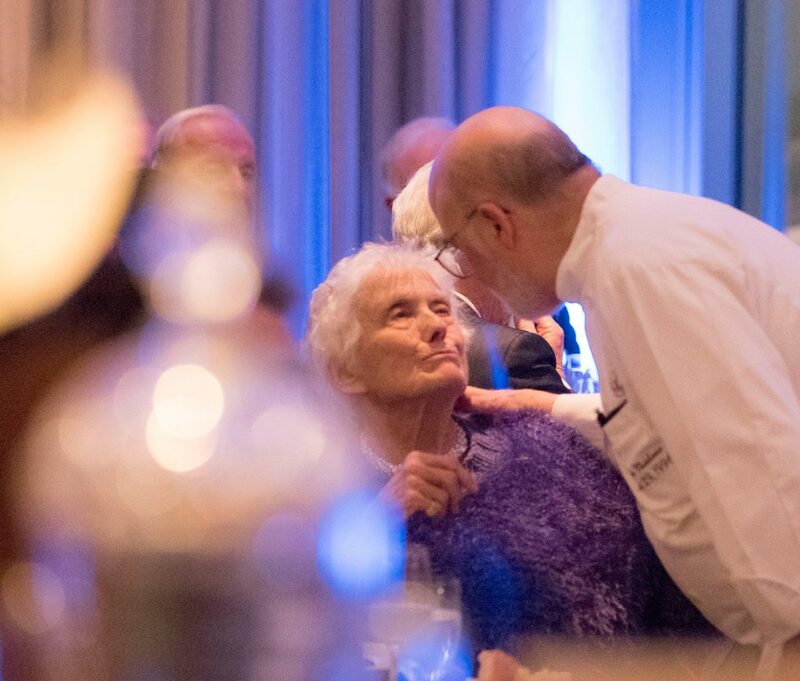 Lisa and Carlo Middione at a tribute dinner celebrating Vivande Porta Via in 2015. 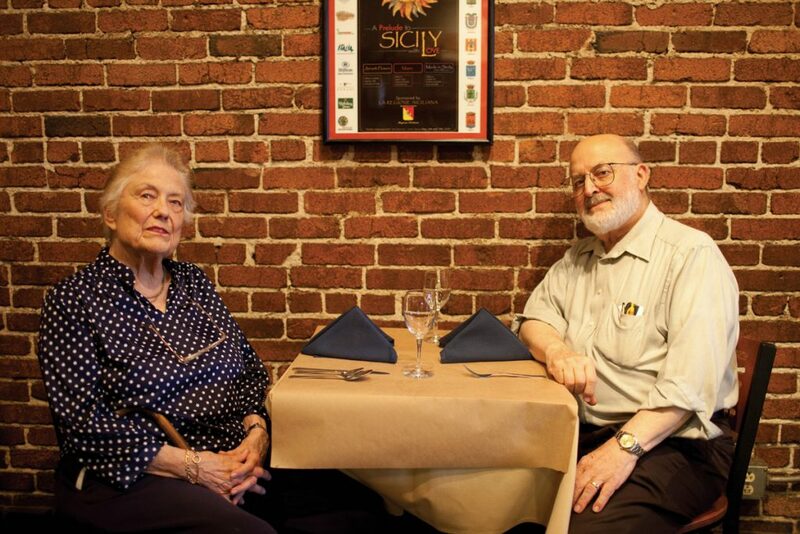 Elizabeth Derby Middione — Lisa to her many friends on Fillmore, where she and her husband Carlo owned Vivande Porta Via for many years — died early on Christmas Eve after a long illness. She was two weeks shy of her 96th birthday. She was a member of two noted American families. Her father, Roger Alden Derby, was descended from one of America’s first millionaires, Elias Haskett Derby, who, in the 18th century, was a privateer for the United States who carried news of the American Revolution back and forth from America and England. Her mother, Elizabeth Palmer Harlan, was the elder sister of John Marshall Harlan II, a justice on the U.S. Supreme Court. Her great grandfather was the first Justice John Marshall Harlan, considered one of the Supreme Court’s greatest justices. Lisa Middione was a serious student of the piano. She completed studies at Julliard and pursued her career for a short period, but was forced to give it up because of a family tragedy. After Middione came to California, she became an impresario, sometimes presenting 350 events per year, including Marion Anderson and Marlene Dietrich. She was also a publicist for many arts organizations, including the San Francisco Symphony, Ballet and Opera, and helped create the Stern Grove Music Festival, which she directed for 10 years, and where she met her future husband. He did, in 1968, and he remained devoted to her until the end of her life. Lisa and Carlo Middione at Vivande. 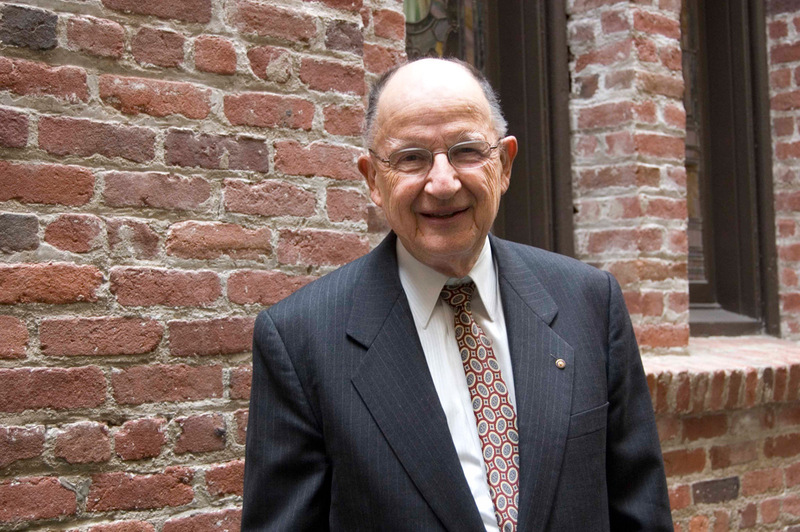 WHEN BUSH STREET resident Palmer Sessel still wore a tie and worked in the Financial District, he liked to get out of the office midday and think things over. One day he walked by the historic Monadnock Building on Market Street and was struck by the cast of notable San Franciscans looking down at him from the trompe l’oeil mural above the marble cornice. The guard told him the artists who created it had a studio upstairs. 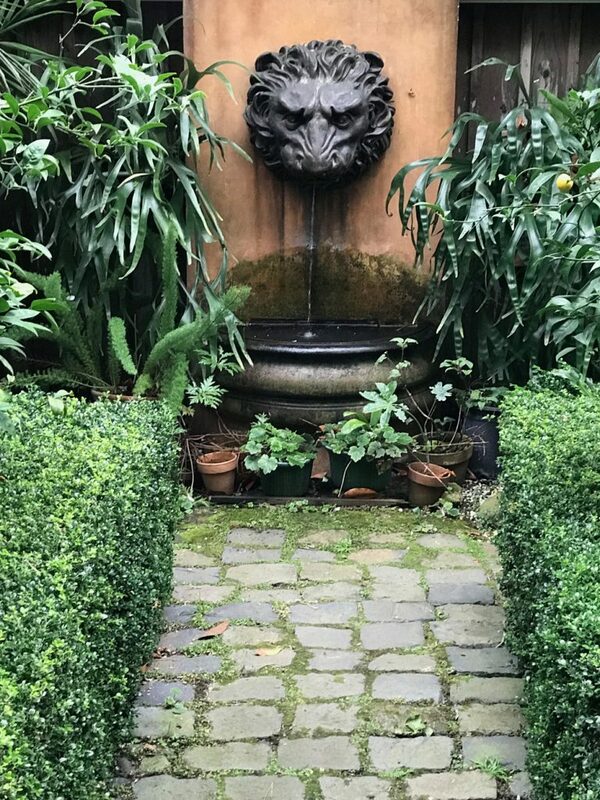 He went up and engaged them to create a mural of a winged bulldog on the ceiling of the living parlor in his classic Victorian near Cottage Row. “They tried to dissuade me” on the flying bulldog, Sessel says. But Mark Evans and Charley Brown took the commission, and also painted a Bacchanalian scene for the dining parlor, and nudes above the bed. In the process, they also fell for the neighborhood, and decided they wanted to live here. Over the next three decades, they set about making it their greatest art project, bounteously filled with their own work and layers of treasures from around the world. On the ground level, overlooking a south-facing garden, were studios for both artists. In 1984 they established Evans & Brown, a fount of their ever-expanding creative output: murals, paintings, objets d’art, wall coverings, fabric, carpet and more. They found artistic and commercial success, and an enduring business and personal partnership. Only days after they returned from a final grand tour of the splendors of Venice and Paris, Robert Charles Brown died of prostate cancer on November 21, 2018, at home on Bush Street. His husband of 41 years, Mark Evans, and their schnauzer, Jack, survive him. The Rev. Dr. Laird J. Stuart followed the Rev. Dr. James G. Emerson as pastor of the Calvary Presbyterian Church at Fillmore and Jackson, both chronologically and in a determination to bring to the historic church a greater awareness of social justice issues. On December 19, 2018, he followed Emerson, who died three months earlier, on September 12, to the heavens. Emerson was a powerful preacher and a pioneering pastor of Calvary in the 1980s. And he practiced what he preached about equality and justice, even getting arrested while participating in a 1987 interracial civil rights “march for brotherhood” in Forsyth County, Georgia. Stuart built on the social consciousness Emerson had brought to what was then a sometimes staid, largely affluent, almost entirely white congregation. 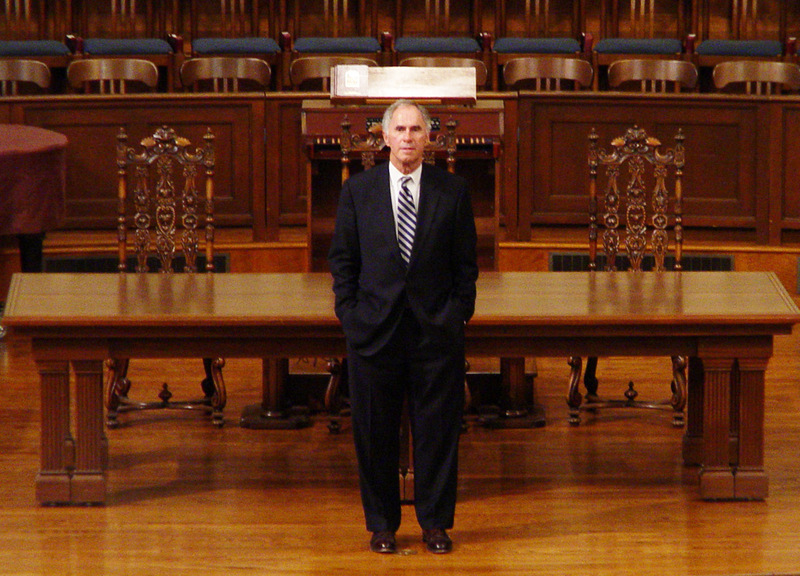 Stuart served from 1993 to 2010 and led the fight against homophobia in the Presbyterian church. He was the first president of a nationwide group that lobbied what he called “the radical middle” in the Presbyterian church, urging that people be ordained as ministers, deacons and elders regardless of gender or sexual orientation. Today Calvary has a diverse group of ministers and banners hanging outside with a rainbow flag declaring that “Black Lives Matter” and proclaiming it a sanctuary church — suggesting that both men made their mark. 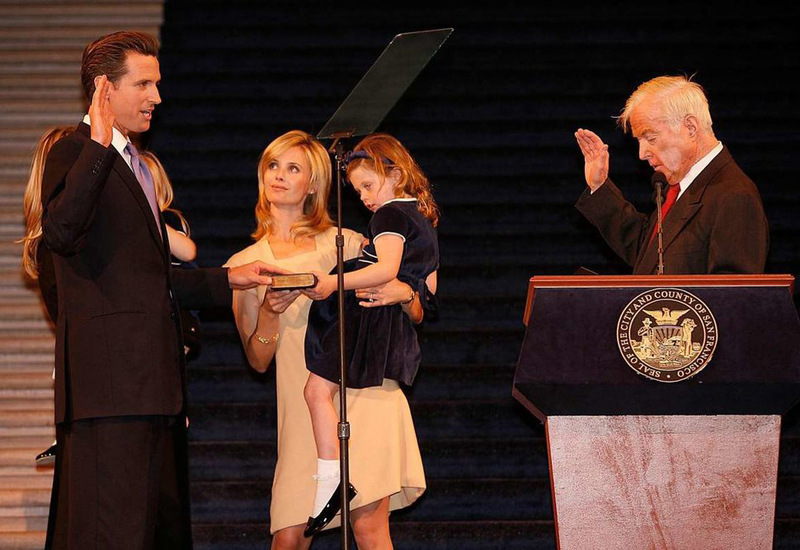 Justice William Newsom administering the oath to his son Gavin, California’s new governor. When he came in, he’d lovingly hold the hand of whichever pretty French waitress was on duty and recite the French poem La Cigale et la Fourmi (The Cricket and the Ant) in its entirety. Since I am not a pretty French waitress, he would always greet me respectfully with a long handshake. As I’d open a half bottle of his favorite Chateauneuf du Pape, he would sometimes confide, “Gavin’s doing well.” The judge’s death came just weeks before his son — another former neighborhood resident — was to be sworn in as governor of California, serving the state his father served as a justice on the First District Court of Appeal. Farewell, judge. Thank you for your kindness and style. WE ARE DELIGHTED to announce the publication of a lavish new book of stories and photographs celebrating one of the world’s great neighborhoods: our own. 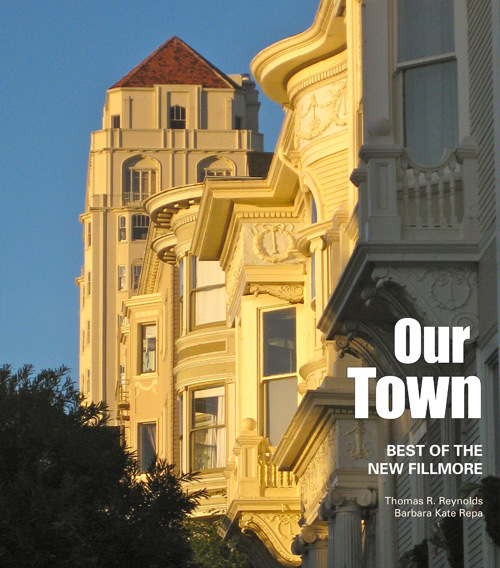 This collector’s edition pulls together favorite articles and images from our pages of some of the people and places that make the neighborhood special. 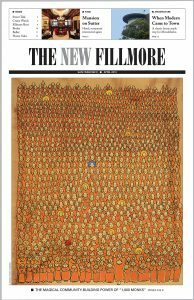 We hoped to create a book worthy of the neighborhood, but may have gotten a little carried away: This is a 268-page oversize extravaganza published by a meticulous local publisher, Norfolk Press. 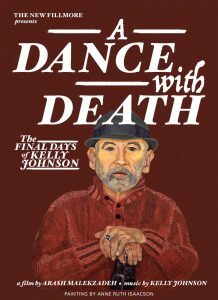 It is available at Browser Books at 2195 Fillmore Street, or order by mail here. The Neuhaus Brothers clothing store at 1806 Fillmore Street. At age 95, neighborhood resident Jerry Neuhaus is one of the last surviving business owners who operated in the Fillmore District before it was demolished by the Redevelopment Agency in the 1960s. And he’s still nearby — only four blocks from the clothing store he and his family ran for decades at Fillmore and Sutter. 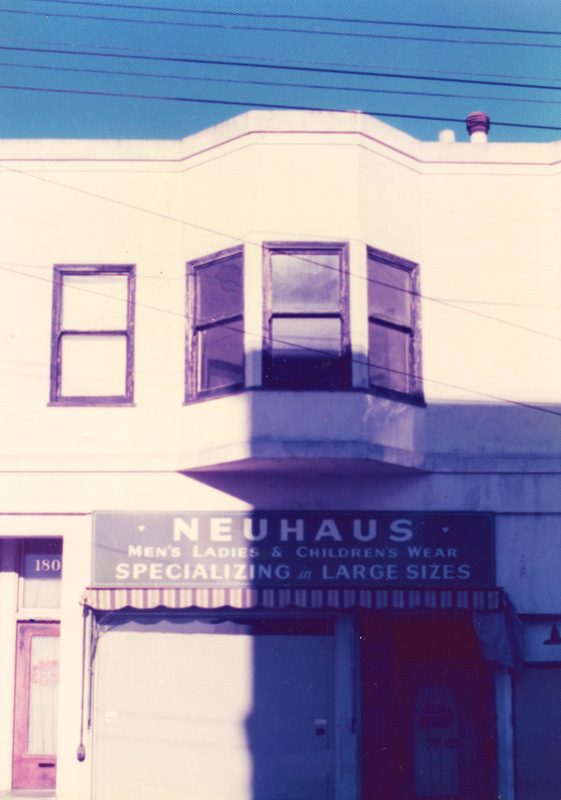 Neuhaus was born in 1922 in Spangenberg, a small town in central Germany, where his father ran a department store. As conditions deteriorated rapidly for Jews in Hitler’s Germany, an aunt and uncle who had earlier come to San Francisco urged his family to join them here. Neuhaus managed to leave Germany with his mother, father and sister in 1937, bringing along a sacred Torah scroll. Jews who were able to escape could bring little money with them. But some people in the know suggested they bring Leica cameras, which were in high demand in the United States. Once in San Francisco, they were able to sell the cameras and use the proceeds to get established. His uncle helped Jerry’s father start a clothing store, Neuhaus Brothers, at 1806 Fillmore, just north of the corner of Sutter Street.